Licda Nory Álvarez Betancourth was 25 years old when she became a GOJoven Fellow. She is currently the Executive Director of the GOJoven Honduras Association, of which she is a founding member. 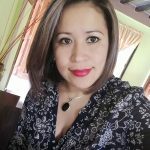 Licda has a degree in Public Accounting and Finance from the National Autonomous University of Honduras and has worked for 13 years in the area of internal auditing. Licda is passionate about social justice issues and defending the rights of women, children, adolescents, and youth, especially in her volunteer work with youth from marginalized communities. She previously served as board member of the National Council of Honduran Youth Population (CONJUPH) during the period 2005-2010; represented the CONJUPH in the Alliance for Children, Adolescents and Youth; and participated in advocacy processes for the approval of the Framework Law on Youth and the creation of the National Youth Institute. Licda has also facilitated HIV/AIDS Prevention, Autism, and Women’s Rights campaigns and workshops, as well as projects with blind youth and helped to manage funds for projects for children and youth of the Col. Las Torres.